My seventeen-year old GE microwave (OEM) gave up the ghost a couple of months ago, but since I didn’t use it very much, I almost didn’t replace it. But we did. I found a nice stainless steel Whirlpool that completely matched the stainless steel Frigidaire stove that we put in when we moved in here some years ago, so now that corner of the kitchen looks happy. The two appliances look like they were made for each other! There are a number of controls on the new microwave that I have been testing out, and, much to my surprise, I am really liking a few of them – Rice Pilaf, especially. But I still don’t like the way a microwave actually cooks most foods, or the final result from reheating leftovers, so I am more than thrilled with the Cuisinart Oven Central. Its uses for making my life easier are making themselves known to me, and I’m lovin’ it! It lets me think of new ways to prepare and serve food. The above was a snap to reheat and serve, with just our plates and silverware to clean up – BONUS! The piece of parchment paper kept anything from burning down onto the bottom of the unit, while imparting no extra calories. Although there was some spillage over the sides of the paper, nothing burned onto the pan at all, so clean up involved only a moistened, slightly soapy, sponge, and then a wipe out with a damp paper towel to get out the soap. There is a drop-in pan that is probably best used for baking, that can be removed and washed in the sink, and I may try that next time, but this worked really well even though it requires a teensy bit more effort to clean out the oven itself. Time lapse was approximately two minutes, including the time to get out a new roll of paper towels. I use Viva because they are so soft and easy to use in such instances. I find the stiffer ones of less ease of use. The meal shown was basically all leftovers that I embellished. The little Yukon Gold potatoes were already cooked (I had done them in the Crock-Pot the day before.) I sliced part way through each one and put a small slice of jalapeño pepper cheese in each slice. Then topped with some chopped pickled peppers from a jar. 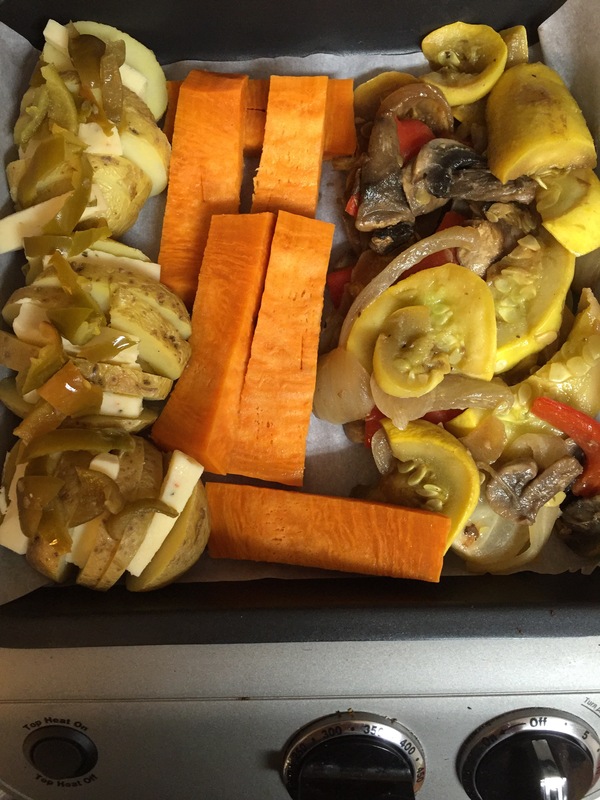 The sweet potato was already cooked (also previously in the Crock-Pot), and the crookneck squash, mushrooms, red peppers, and onions melange was from the night before. After piling it all in the Oven Central and making the portrait, I added some slices of roast pork on top and turned it to 350 degrees and set the timer to turn it off for me in fifteen minutes. I moistened the whole of it with a few spritzes of distilled water that I keep in the kitchen in a small spray bottle. Most foods can do with a bit of extra moisture, and the fine mist from the sprayer distributes this benefit evenly. Since the Oven Central has heat coming down from the top, this is especially useful in this application. I whipped up a quick ginger-based sauce for the pork slices using my trusty bottle of Cole slaw dressing and the new bottle of minced ginger. I’m really entranced with this form of ginger. I’d always used fresh, but it is expensive, hard to peel, fairly wasteful because of that peel, and doesn’t keep terribly well, so I’d kind of quit using it in the last few years. It’s great to be using ginger again; we’re enjoying the unique flavor it brings to so many foods. This entry was posted in Food, Uncategorized and tagged Arizona, Crookneck Squash, Cuisinart Oven Central, Dinner, Kitchen, Mushrooms, Onions, Red Peppers, Roast Pork, Vegetables. Bookmark the permalink. Wow, your old microwave lasted a long time. I think that my last microwave only worked for 5 or 6 years.